This is an African Classic, this is your starting point to African Literature. I read this book in 2 different languages; Spanish and English. I loved it. I own it and it is my favourite. It was written and published before the Nigerian Independence from the British. Below is how I felt when I read it. "I enjoy every page of this book.. I read it in Spanish and in English, this book is really amazing I learnt a lot.. and would recommend it to everybody." This book is mostly about post-colonialism, colonialism, the igbo people... I highly recommend it to everybody. 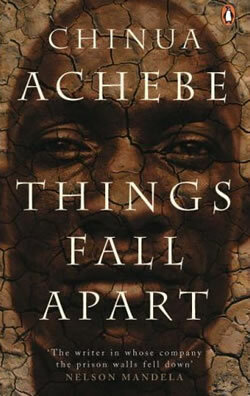 I found out this is part 1 of a Trilogy (Things Fall Apart, No Longer at Ease and Arrow of God). I will read the other 2 but before that I will read Things Fall Apart for the 3rd time again. Classic for real! Have you read it? I read Things Fall Apart ages ago (in secondary school, I think) and I found the storyline so profound. Indeed, this classic revelas a lot about Igbo custom and traditions which they hold dear, even up to now. Achebe portrayed how colonialism destroyed some of the customs of the people while at the same time, using religion to divide families. The coming of the white man to Africa has both its merits and demerits. The other day I met a friend that I borrowed this book from in Spanish language and she told me Things Fall Apart is just part 1 of a trilogy, I was like what? I investigated and yes the story continues with No Longer at Ease and Arrow of God. I am going to order the last 2, before I read them I will read Things Fall Apart again for the 3rd time and read the 2 other at a Go!.